Infinite Art Tournament: The Great Movies: "Vivre sa vie"
Vivre sa vie is one of two movies on Ebert's list that are sufficiently obscure, or unpopular, or whatever, that they are not available from the collection of the Multnomah County Public Library. So I made my way up the street to our neighborhood movie rental store Movie Madness, an institution that has cut out for itself a survivor's niche in its dying industry by catering to people who are looking for obscure and unpopular titles. For instance, while I was there they had the sequel to the classic 1989 James-Belushi-and-a-dog vehicle K-9 playing at high volume. I found Vivre sa vie easily in the extensive Goddard section. "Has it been a while since you were here last?" asked the cashier, failing to find my record. "Um, 1999?" I replied. And then I had to fill out a whole new membership application. "This is outrageous!" I protested. Anyhoo, Vivre sa Vie. 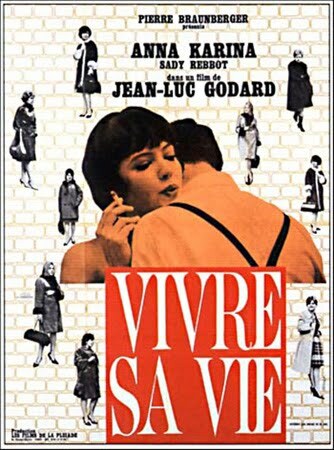 Sez here it means "To Live Her Life," but it was released in the U.S. as "My Life to Live" and in the U.K. as "It's My Life." Whatevs. The subtitle is maybe more important anyway: "A Film in Twelve Scenes." Most of these scenes are set in a single location for a discrete length of time. Some of them are in the form of fairly straightforward film narrative, while others are more experimental. The overall story [here come the spoilers!!!] is the decline of a minor actress into petty crime and prostitution. She seems unbothered by this, or much else really. But then no one in the movie expresses the slightest emotion throughout, with the exception of a bureaucratic police officer who seems to experience a touch of concern at one juncture. For we are back again into the emotionally constipated school of mid-century European art film, and it's all about the existentialism, baby! So when our character dies suddenly at the end of the film, she of course does so meaninglessly and alone. The most interesting of the twelve "tableux" are the more experimental ones. The protagonist's induction into prostitution is shown as a long montage of expressionless pickups and encounters while, in voiceover, we hear a highly technical FAQ of the sociology, law, and standards and practices of mid-century French prostitution. It renders the shocking banal, and I imagine was a source of inspiration for some of the indie directors of the 1990s. In the 11th scene, our heroine is in a coffeehouse and runs into Brice Parain, a philosopher of language (played by himself), who has a gentle conversation with her about, well, the philosophy of language. Abstract as can be, it is easily the most humane moment in the film. Many of the more straightforward scenes, however, are spare to the point that they are frankly kind of boring. Goddard, moreover, was not always as attentive as he might have been to ensuring that we watchers would know what the hell was going on. This is not always a fatal flaw in a movie, but since the entertainment factor is pretty low in Vivre sa vie, being stymied as to why things are happening just causes further frustration. Plot: Young woman fails to arrest downward trend. Visuals: What are we to make of the first of the twelve scenes, which is a conversation shot showing the back of the characters' heads instead of, as is more traditional, their faces? It's experimental! It creates a mood! It's annoying! And so with much of the movie. Later, we're going to watch for three or four minutes as the character struggles to write a simple letter. This is very effective at showing us that she is a bit lacking in her intellectual toolkit, but it's also three or four minutes that we are sitting there, watching a pen move on paper. Not riveting stuff. Dialog: See "emotionally constipated school of mid-century European art film," above. Prognosis: Slackers meets Pulp Fiction as directed by Jean-Paul Sartre on downers. Recommended for big-time film geeks only. Perhaps the original dialogue was full of intense literary nuance? I couldn't type it in to Babelfish fast enough to find out. I may have a higher tolerance for arty cinematic minimalism than M5K, and found this film quite watchable in its spareness. (Though I commented, when it was over, that it "probably wouldn't make my top one thousand," that's undoubtedly faulty math on my part. I'm sure I would be forced to press it into service quite a bit sooner as I struggled to remember what I've watched in my lifetime.) I found many details telling and thoughtfully revealed. Having the movie divided into twelve discrete, titled units also helped quite a bit, partly in the way that short chapters are helpful in a less than riveting book, or paragraphing can help break up an overlong comment into a manageable if still somewhat tedious passage that comes, at last, if not to an emotionally charged conclusion that rewards the patience of the reader, at least to a close. Mrs.5000, you crack me up.